I’ve seen the overwintering monarch butterflies in Pacific Grove, CA. These butterflies live west of the Rocky Mountains and fly nearly 2,000 miles to roost in the pines and eucalyptus trees on the Pacific coast. This migration happens over several generations and none of the individual butterflies have ever traveled the migration route before. Amazing! Monarchs here in the mid-west and Canada migrate 3,000 miles to over-winter in the Oyamel fir forests in central Mexico. Let’s call the butterflies who make the long migration to Mexico the first generation. The migration begins in August and the monarchs overwinter in Mexico for about 5 months. The following March these same butterflies fly north to lay eggs in the southern US. May–the eggs of the monarchs from Mexico hatch (in the southern US) and these children fly farther north to lay their eggs. June–the grandchildren hatched in the north lay eggs in the north. July–the great-grandchildren hatched in the north lay their eggs in the north. August–the great-great grandchildren hatched in the north migrate to Mexico to overwinter in the Oyamel fir forests. Four generations of monarch butterflies complete this migration cycle. The pupa stage (chrysalis) of the monarch lasts only 10 days, when the caterpillar metamorphoses into the butterfly. Butterflies live for about 4 weeks, but the migrating generation of Monarchs can live up to 8 months. They have taste receptors in their feet, so when they walk on a flower they are tasting the nectar. When butterflies emerge from the chrysalis, their proboscis is in two separate pieces. These pieces must be fitted together immediately to form their single nectar-drinking tube. Butterflies are near-sighted and can only see well up to about 12 feet. They see many of the same colors humans see, and a range of ultraviolet colors as well. Illegal logging of the Oyamel fir trees in Mexico has very significantly decreased their overwintering habitat. Severe winter storms during their hibernation in Mexico kill them by the millions, and with far less Oyamel fir trees, they are far more exposed. Monarchs only lay their eggs on milkweed plants. This is the only plant the monarch caterpillar can eat. The spraying of glyphosate herbicides on vast millions of acres of farmland in the mid-west has killed off the milkweed. No place to lay eggs, nothing for caterpillars to eat. No monarchs. Stewardship is part of our responsibility as the dominant species on the earth. We are working on this. Illegal logging of Oyamel fir trees has been lessened, but still goes on in secret. It has been suggested that huge farms in the mid-west leave one hedge on one side of each field herbicide- and pesticide-free. This would provide habitat for native milkweed species and monarchs, as well as habitat for other insects and other wild flowers. They are still working on this. The use of the herbicide glyphosate (brand name Roundup) has increased since the late 1990’s to over 180 million pounds per year sprayed on farm fields. Roundup effectively wipes out native milkweed species. We really need to work on this. 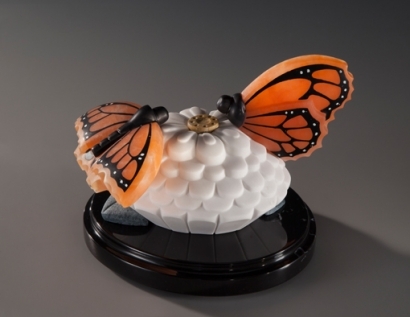 The butterfly bodies are made from Mongolian Imperial Black marble, along with the wing pattern inlays. The zinnia is an important nectar flower for the monarch, this one carved from the Greek Sivec marble. The center of the zinnia is Amarillo Negrais marble, and the leaves are Verde Guatemala marble. That makes five stones altogether. This stone sculpture was the epitome of creative problem-solving for me, particularly the monarchs themselves. Every aspect of their creation was thought through until I believed I had a method to make them. So many questions: How thick to make the butterflies? How to attach the bodies? Do I need antennae? How to make the black veins? Do I need the white spots on the wings? How to make them? How to attach the butterflies to the flower? Which butterfly flower should I carve? Do I have the patience to carve all those zinnia petals? Do I need leaves? With each stage of production I was never sure if it would actually work out, and each stage in the process was contingent on the previous process. The black veins in the wings were made by carving out tiny channels in the wings, sanding the channels so they create a crisp and smooth line, then mixing black marble dust with resin and putting it in the tiny channels, grinding off the globs of extra resin, then sanding them smooth. How deep should I make the channels? Are the channels sufficiently filed on the inside surfaces to make neat lines? How much can I sand down? Will I sand too far and sand away the channels? How thick or runny should the marble resin be to get it into the channels? Will it fill the channel? Can I refill it if it doesn’t fill all the way? There were weeks and weeks of this inner monologue of endless questions–thinking and re-thinking and trying on different approaches. It was exhausting and exhilarating at the same time. A bit like watching grass grow if you are not caught up in the process, but fascinating and challenging in a frightening way if you are. Monarchs matter. So do polar bears, sage grouse, blunt-nosed leopard lizards and leatherback sea turtles. They do.